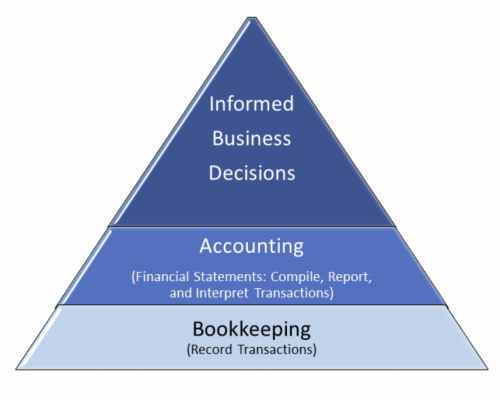 Although similar and related, Bookkeeping and Accounting are quite different. Bookkeeping is the recording of financial transactions, that creates the foundation for Accounting, which is the compiling, reporting, and interpretation of those transactions. The result is Financial Statements and the stories they tell, enabling us to make informed business decisions. Since these stories are told in the “Accounting Language,” they sometimes need an interpreter, your Top2Bottom Business Solutions Accounting Advisor. With a thorough review of your Financial Statements on a regular basis, you are better able to make informed business decisions, such as cash flow planning, expansion investment, and tax planning. The Bookkeeping and Accounting functions often overlap, with experienced bookkeepers performing Accounting tasks, and Accountants reviewing and entering transactions. Top2Bottom Business Solutions assures that your bookkeeping and accounting needs are met with the appropriately experienced staff, “Top2Bottom!"